The stomach is a hollow, bag-like muscular organ which is located in the upper abdomen to the left of the midline, within the peritoneal cavity. Its proximal aspect is in continuity with the oesophagus. The distal end of the stomach leads to the first part of the duodenum. The stomach has several regions. The cardia is the part of the stomach that is immediately adjacent to the gastro-oesophageal junction. The fundus of the stomach is the portion which protrudes above the orizontal plane that contains the gastro-oesophageal junction. The body of the stomach constitutes the majority of the stomach. The antrum is located towards the distal end of the stomach and has a smaller diameter than the body. The distinction between the antrum and the body is made on the basis of their different types of mucosa. The pyloric canal is the most distal part of the stomach and connects the stomach to the first part of the duodenum. 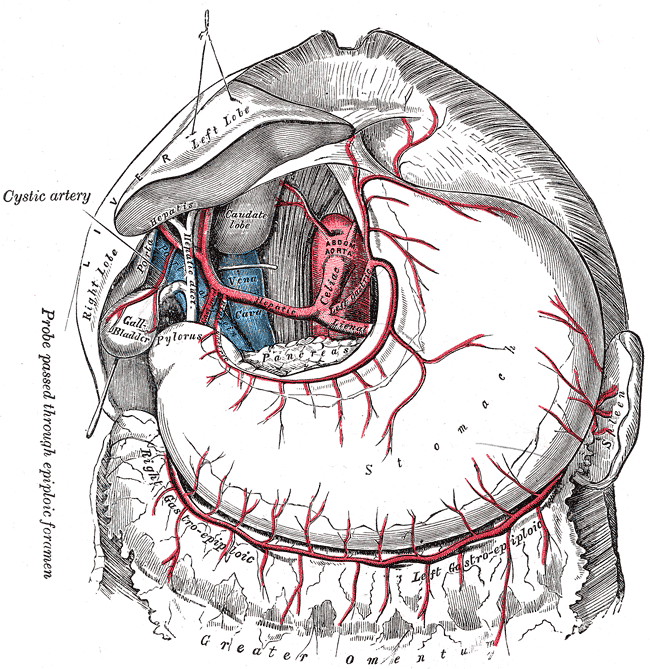 The circular muscle of the pyloric canal is prominent and functions as a sphincter. The antrum and pyloric canal may collectively be known as the pyloric part of the stomach or pylorus (the term pylorus may also be used to imply the pyloric canal alone). The greater curve of the stomach runs on the left side of the stomach from the gastro-oesophageal up over the fundus, around the left side of the body and the inferior aspect of the antrum to reach the pylorus and gastroduodenal junction. 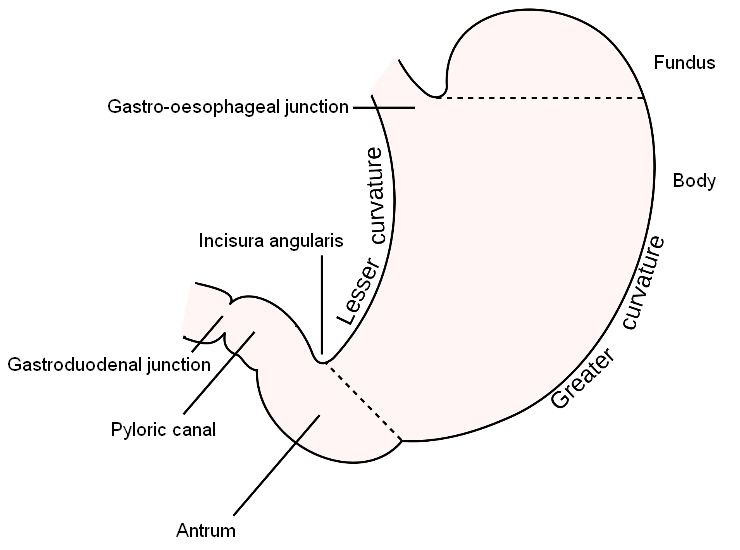 The lesser curve runs on the right side of the stomach from the gastro-oesophageal junction down the right side of the body and over the superior aspect of the antrum and pylorus. The lowest part of the lesser curve may have a notch, the incisura angularis, which is usually in the vicinity of the junction of the body with the antrum. Diagram to show the parts of the stomach. The stomach has the standard four-layered arrangement of the gastrointestinal tract. 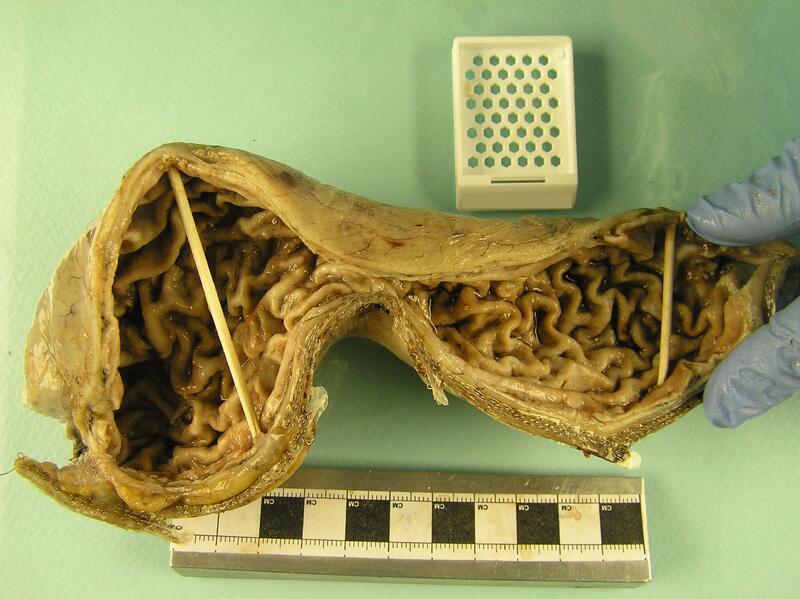 The innermost layer is the mucosa, which is separated from the submucosa by the muscularis mucosae; the mucosa forms thick folds known as rugae. Beneath the submucosa is the muscularis propria. Unlike the oesophagus and intestines, the stomach has three layers of muscle in the muscularis propria; all of the layers are composed of smooth muscle. The innermost layer is deployed in an oblique pattern, the middle layer in a circular arrangement, while the outer layer of muscle is longitudinal. The most external layer of the stomach is peritonealised serosa. The stomach is supplied by several different arteries, all of which are ultimately derived from the coeliac trunk of the abdominal aorta. The left gastric artery is a direct branch of the coeliac axis and supplies the upper portion of the lesser curve. The right gastric artery is a branch of the common hepatic artery and supplies the lower portion of the lesser curve. The right gastroepiploic artery is a branch of the gastroduodenal artery (which is itself a branch of the common hepatic artery). It supplies the right side of the greater curve of the stomach (as well as the omentum). The left gastroepiploic artery arises from the splenic artery and supplies the left side of the greater curve and the omentum. The short gastric arteries are also branches of the splenic artery and supply the upper part of the left side of the greater curve. The veins follow the arteries and eventually drain into the hepatic portal vein. The lymphatic drainage of the stomach follows the blood vessels. 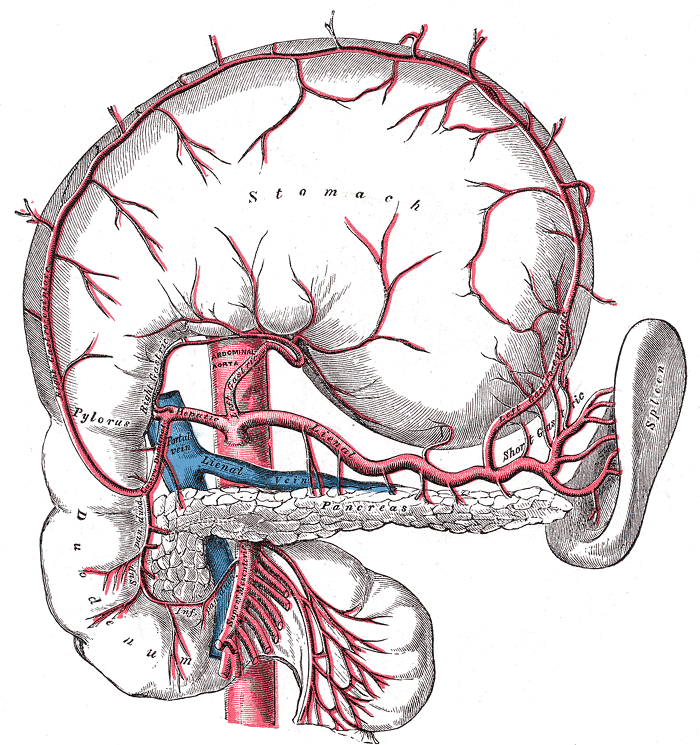 Diagram of the blood supply of the stomach from the front. Diagrams from Wikipedia Diagram of the blood supply of the stomach, viewed from the front with the stomach lifted up and turned over to show its posterior aspect. The stomach receives parasympathetic innervation from both vagus nerves. The sympathetic innervation is relayed to the stomach via the coeliac ganglion. The parasympathetic nerves stimulate gastric activity while the sympathetic innervation inhibits gastric activity. The mucosa of the stomach is glandular. The mucosa is thick, particularly when compared with other parts of the GI tract. Two types of gastric mucosa are present. Non-specialised gastric mucosa is found in the antrum and pyloric canal and consists of glands that are lined by cells which make mucin, together with neuroendocrine cells. Specialised mucosa is located in the body and the fundus. In addition to the mucin-secreting cells (which occupy the superficial part of the glands) and the neuroendocrine cells, specialised gastric mucosa features parietal cells and chief cells. The parietal cells possess red cytoplasm and secrete gastric acid and intrinsic factor. The chief cells produce pepsinogen. 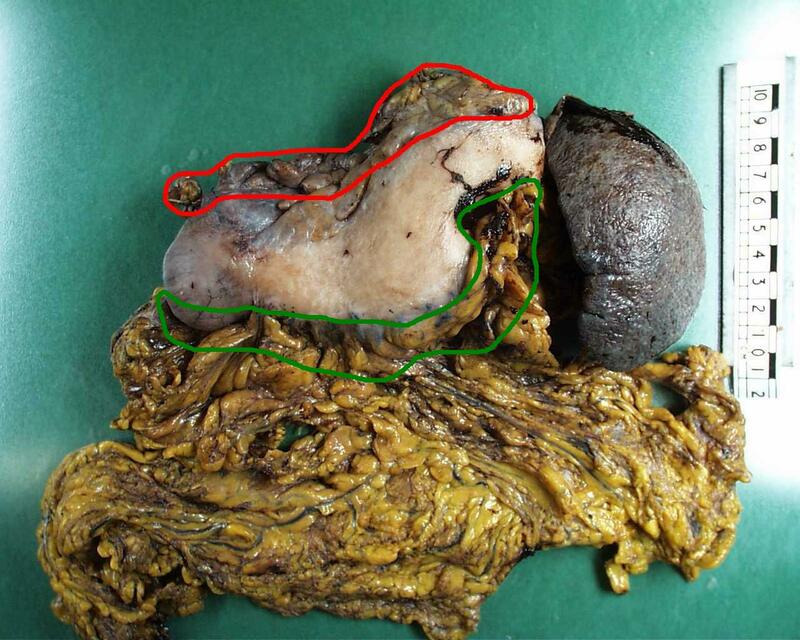 The greater omentum is a large apron of peritoneal-covered fat which hangs down from the greater curve of the stomach. Located behind the stomach are the diaphragm, pancreas, left adrenal gland, part of the left kidney and the transverse mesocolon. The liver is situated in front of the right side of the stomach. The stomach and transverse colon are both quite mobile structures, which means that the transverse colon may be found either inferiorly or anteriorly to the stomach. The spleen is situated lateral to the stomach. The stomach begins the process of digestion in earnest and achieves this by both mechanical and chemical means. The three layers of smooth muscle in the stomach allow it to churn the food and physically break it down into small pieces and mush. This process is aided by the secretion of gastric hydrochloric acid which chemically digests the food. The chief cells of the stomach secrete pepsinogen, which is the inactive precursor form of pepsin. Exposure of the pepsinogen to gastric acid converts the pepsinogen to the active form pepsin. Pepsin breaks down proteins. The effect on the food of the mechanical and chemical digestion is to produce partially digested, liquid food known as chyme. The chyme is slowly released into the small bowel by the pyloric sphincter, which also prevents reflux of duodenal contents into the stomach. The pyloric sphincter allows the stomach to retain the more solid, undigested parts of the meal while forwarding the chyme to the duodenum. The stomach has a capacity of up to 2 to 3 litres and can require several hours to complete its processing of a meal. With the exception of alcohol, significant absorption of the meal does not occur in the stomach. In addition to its role in digestion, gastric acid has an antibacterial action and is thus part of the innate immune system. The mucosa of the stomach needs to be protected against the gastric acid and this is achieved by the gastric mucosal barrier, which is formed by a layer of mucin that is secreted by the gastric glands. The gastric glands also secrete bicarbonate which forms a protective layer beneath the mucin. The actual generation of gastric acid by parietal cells relies on an ATPase ion pump that shifts one hydrogen ion out of the cell in exchange for a potassium ion from the lumen of the stomach. The ion pump hydrolyses ATP to obtain the energy needed for this pumping. Other pumps move both chloride and potassium ions from the cytoplasm of the cell into the lumen of the stomach. The hydrogen ions are provided by carbonic acid, which is generated from carbon dioxide and water. The bicarbonate ions that are abandoned by the hydrogen ions diffuse out of the cell into the blood while chloride ions move from the blood into the parietal cell. Gastric parietal cells can be stimulated to produce acid by three different signals, acetylcholine, gastrin and histamine. Acetylcholine is released from parasympathetic nerves that innervate the gastric mucosa. Gastrin is a peptide hormone which is released by the G cells of the gastric antrum and the duodenum. Histamine is secreted by the gastric mucosa itself and thus acts in a paracrine fashion; histamine is the dominant influence on gastric acid secretion. The secretion of gastric acid in response to a meal is considered to have three phases. The first phase is the cephalic phase and precedes the food reaching the stomach. Seeing, smelling and tasting food can trigger activity in neural pathways in the brain that increase activity in the fibres in the vagus nerve which innervate the gastric parietal cells. This vagal activity stimulates acid secretion. The cephalic phase is entirely dependent on the vagus nerves. Once food reaches the stomach the gastric phase of acid secretion can contribute. The stomach can detect the distension that the arrival of a meal produces but can also sense the presence of certain food substances, such as amino acids, fats, glucose and other carbohydrates, in a manner which could be considered to be a subconscious form of taste. All of these stimuli alert the stomach to the fact that food has arrived and that it is time for the stomach to do its thing. Gastrin is released from the antrum and paracrine secretion of histamine occurs. In addition, the various stimuli are detected by the vagus nerve and vagal reflex pathways fire to promote acid secretion. The gastric mucosa is able to sense the luminal pH and once the pH becomes markedly acidic, the secretion of more acid is inhibited. The duodenum has to deal with the output of the stomach and not surprisingly likes to have a say in what goes on in the stomach. This is the intestinal phase of acid secretion. Initially, the distention of the duodenum by the chyme and the presence of partially digested food products promote the release of gastrin by the G cell-type neuroendocrine cells of the duodenum. Later, the reduction in gastric pH results in the delivery of acid to the duodenum, which is where the duodenum draws the line. An acidic pH in the duodenum causes the duodenum to release secretin into the blood. Secretin tells the stomach to calm down a bit by inhibiting the release of gastrin and inhibiting the ability of the parietal cells to respond to gastrin. The arrival of fatty acids in the duodenum also tells the duodenum that the stomach has done a good job. These fatty acids stimulate the duodenum to release hormones which inhibit both gastrin release and acid generation directly. The stomach belongs to the category of a tubular hollow organ. The longitudinal margins are the proximal and distal and in some instances may include part of the oesophagus or duodenum respectively depending on the precise procedure. Lymph nodes may be encountered on both the greater and the lesser curves. Specific types of gastrectomy are described below. The sleeve gastrectomy is performed as a treatment for morbid obesity. The procedure involves removing a portion of the body of the stomach so as to reduce the volume of the remaining stomach and therefore decrease the size of the meals the patient eats. Sleeve gastrectomy specimens are unlikely to harbor significant, if any pathology; the work up of the patient prior to the surgery should have excluded serious gastric diseases. The specimens are sent to verify the accuracy of this work up, in effect as a form of double check. The macroscopic assessment of the specimen is the cornerstone of the handling of the case because if any lesions are present they will probably not have been suspected clinically. This requires the pathologist to be alert, especially because the previous sleeve gastrectomies will all probably have been unremarkable. This highlights a crucial feature of GI pathology. Many specimens, including biopsies, may be normal and in order to avoid falling into the trap of assuming that all specimens do not harbour serious pathology in the absence of clinical suspicion the pathologist must be vigiliant. Sleeve gastrectomies are usually received with a dense line of staples that seal the resection margin. The specimen is opened by cutting immediately adjacent to this staple line along the length of the line. The specimen is allowed to fix overnight. The description should give the measurement of the stomach in three dimensions. The wall thickness should also be measured. The serosa and mucosa should be described, although this will usually take a form along the lines of 'the mucosa and serosa appear unremarkable'. 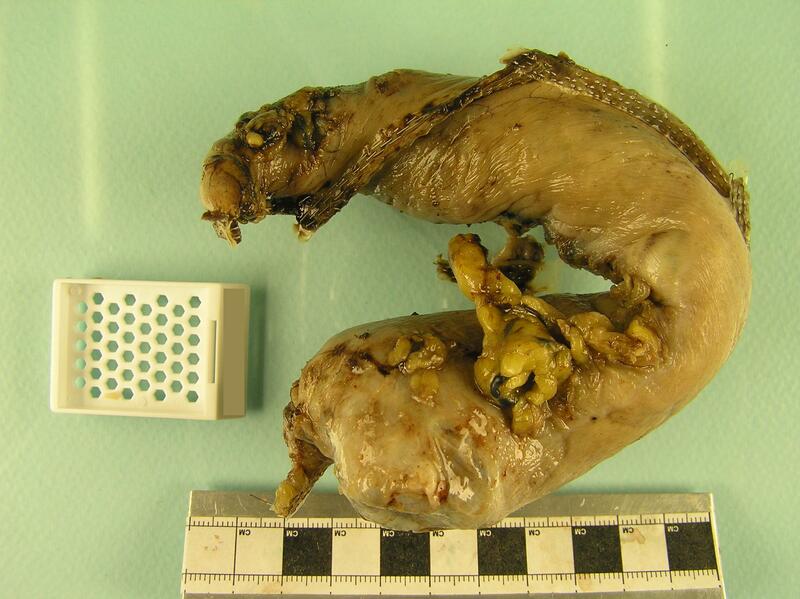 Sleeve gastrectomy specimens may show regions of artefactual sloughing of the mucosa, or attenuation of the wall. If any doubt exists as to whether or not they are artefactual, they can be sampled, although the block key will usually allude to them in no more alarming terms than 'artefactually thinned region'. The standard sampling is to take blocks which represent the margin (to confirm that intact tissue has been used) and the stomach away from the margin. If any focal lesions are observed these should be sampled. Three blocks from each of the margin and the normal stomach should be sufficient; some may argue that this is actually oversampling. A sleeve gastrectomy specimen An opened sleeve gastrectomy. The normal rugal folds are present. Tumours of the stomach may be amenable to surgical excision. This will be in the form of either a partial gastrectomy or a total gastrectomy. Total gastrectomies and partial gastrectomies of the proximal stomach may include the distal part of the oesophagus and be referred to as oesophagogastrectomies. Unless the specimen is a particularly small partial gastrectomy, it is usually opened along its entire length. The large diameter of the stomach means that annular tumours are unusual and it is typically possible to open through part of the wall that is not involved by the tumour. The default choices for the line of opening are the greater curve, or if that is involved by the tumour, the lesser curve. The specimen should be allowed to fix at least overnight. Smaller partial gastrectomies can be treated like an oesophagectomy and serially sliced without opening through the tumour. The description should measure the stomach in three dimensions and state the thickness of the wall of the stomach. The size of the attached greater omentum should be recorded. The relationship of the tumour to the proximal and distal margins should be given and the tumour should be measured in three dimensions. The relationship of the tumour to the serosal surface should be noted. The appearance of the tumour should be described. The proximal and distal resection margins of the specimen will often be quite large and may require several blocks to embedded them en face in their entirety. It may be prudent to block the margins before the specimen is opened because orientation can be difficult to re-establish in an opened gastrectomy that has been allowed to fix. At least four blocks of the tumour are taken and should include the depth of invasion and the relationship of the tumour to the serosal surface. The serosal surface is not a resection margin but involvement of the serosa defines stage pT3 and this is an important parameter to establish. The background gastric mucosa is sampled (usually only one block). Lymph nodes are present in the perigastric fat and this should be dissected. It is prudent to deal with the lymph nodes on the greater and lesser curves separately. The omentum should be serially sliced. Any nodules should be embedded, otherwise two blocks of a macroscopically normal omentum should be sufficient. Gastrectomy specimen. The spleen is attached on the left side. The greater omentum is attached to the greater curve on the inferior border of the stomach. The region in which lesser curve lymph nodes may be found is outlined in red. The greater curve lymph node region is delineated by the green border. An oesophagogastrectomy specimen. Note how the location of the distal margin is difficult to determine precisely. The gastric portion is only a partial gastrectomy. 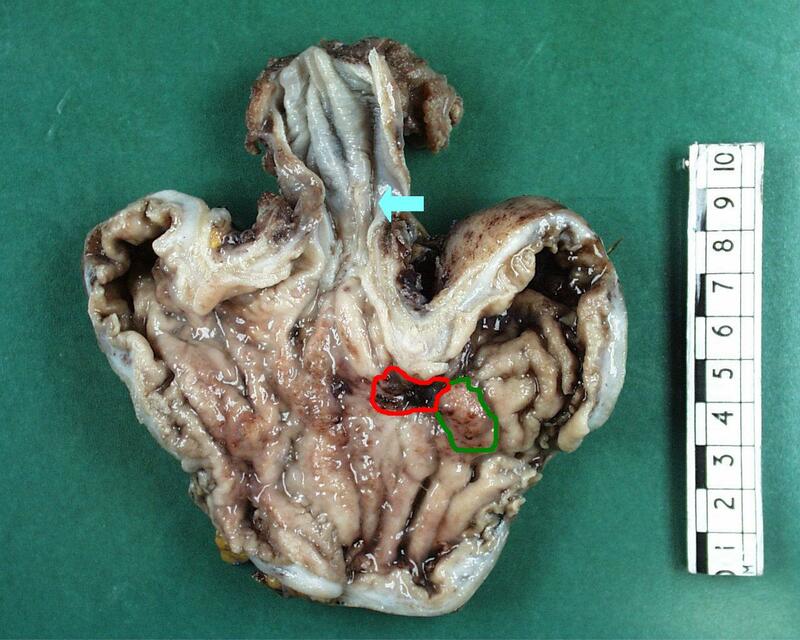 The tumour has a nodular portion (green) and an ulcerated region (red). The gastro-oesophageal junction is indicated by the blue arrow. It is unusual for a gastrectomy to be performed for a non-neoplastic condition, although the procedure may occasionally be necessary for severe acute gastritis, a peptic ulcer or Menetrier's disease. The initial handling and description of the specimen proceed as for a gastrectomy performed for a tumour. If an ulcer is present the cut up will continue as for a tumour, particularly as an ulcer which requires emergency surgery may not have had a previous biospy to determine its nature and therefore could still be malignant. If a diffuse process is encountered then representative blocks of this should be taken; in terms of their cut up these specimens are analogous to those from a large bowel that shows inflammatory bowel disease or ischaemia.